This has been the longest week of the longest month of the longest year of my life. I woke up yesterday realizing I had two choices, wallow in my misery and never leave my bed again or pick myself up, dust myself off and keep myself busy. I’ve chosen the later route and feel slightly better than I did yesterday. I know that I will continue to have those days when hiding from the world sounds like my only option, but living my life to the fullest is so much more satisfying than whining about the mess my life has become. When I am feeling particularly depressed and sad, food and lots of it is usually the answer which only adds to my feelings of inadequacy and unhappiness. So while I have the desire to stuff my face full of ice cream, pizza, and brownies I know that will only add to the problem. My solution is veggies and lots of them. 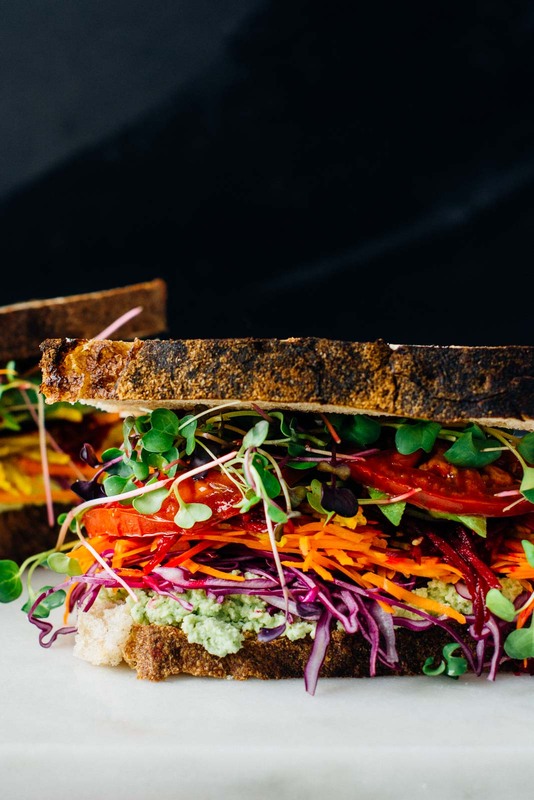 This ultimate rainbow veggie sandwich was just the thing to make me feel like I was eating something super decadent but that wouldn’t cause me to cry when I weighed myself the next morning. 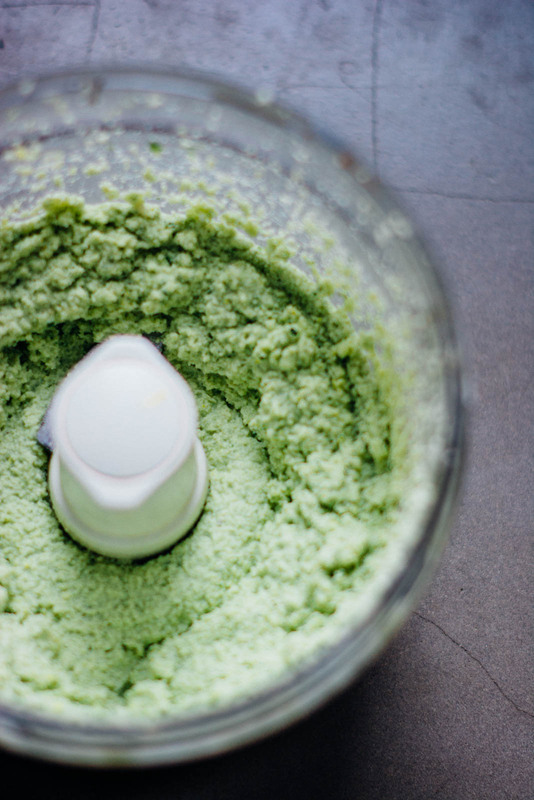 The base is a simple almond ricotta loaded with lemon zest, garlic, and basil. When you prep the ricotta keep in mind that you are looking for a mixture that isn’t too smooth. You want a slightly chunky texture that you would expect from ricotta. From there you can let your imagination run wild. I would suggest picking a variety of textures and colors. 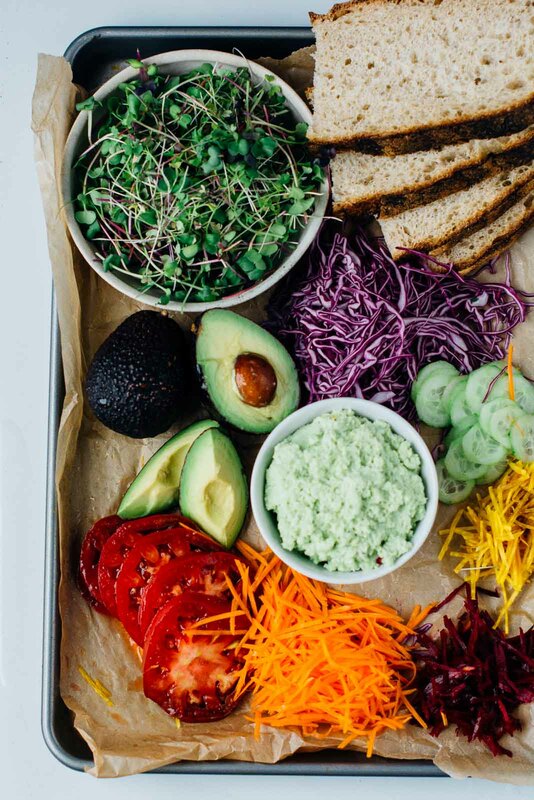 I love the crunch and coolness of thinly sliced cucumbers, avocado for flavor, and I went with carrots and beets for the color and earthiness they impart. The filling would be great layered onto flatbread or thin the ricotta with a bit more water and a few drizzles of olive oil and turn it into a salad. 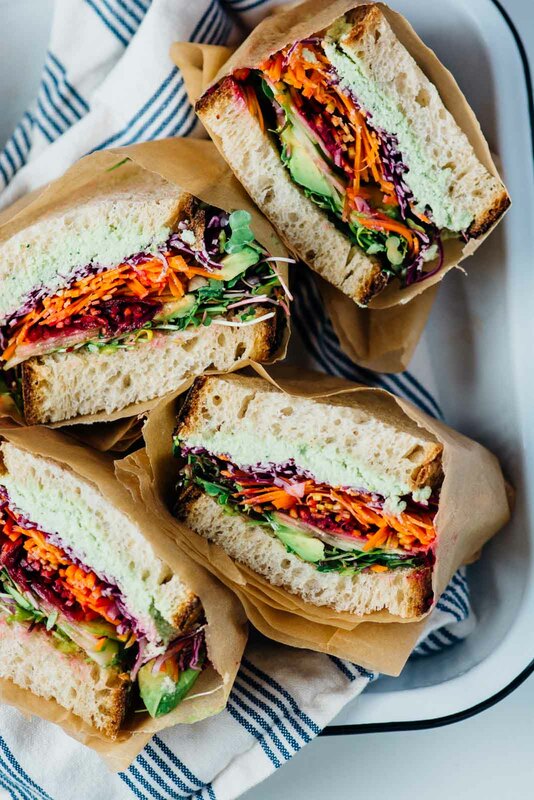 The key to a delicious sandwich is how you treat the vegetables. I like mine paper thin and in abundance. The one kitchen tool that I can’t live without is my trusty Benriner Japanese Mandolin. It is easy to use, clean up is a breeze and at less than $30.00 it has been more than worth the investment. I know that there are fancier and probably better versions on the market, but I just love the ease and simplicity. If you don’t own a mandolin, you could grate the veggies on a box grater, it might not be as attractive but will taste just as good. If you give this recipe a try, I’d love to hear what you think and any variations you dream up! Leave a comment, rate it, and don’t forget to tag a picture #scalingback on Instagram so I can see what you came up with! 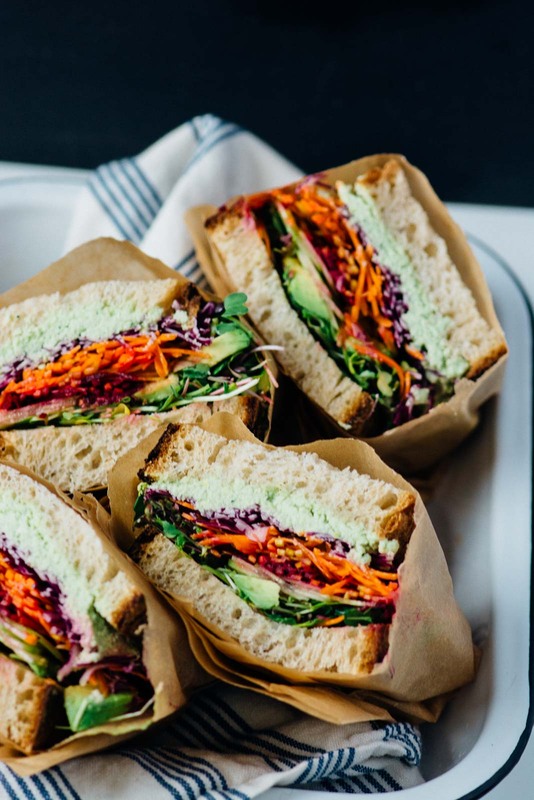 This veggie sandwich is loaded with lots of fresh crunchy veggies and a lemony almond ricotta spread. Soak the almonds in enough water to cover for 1 hour. 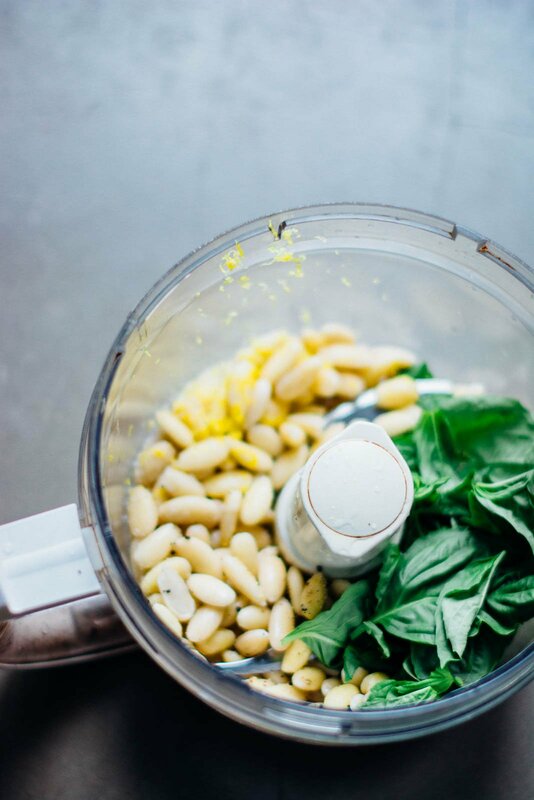 Rinse and drain the almonds and add to the bowl of a food processor along with ⅓ cup water, the olive oil, basil, garlic, salt, lemon zest, and juice. Process until smooth but still has some texture, you are looking for the consistency of cheese. Add extra water a tablespoon at a time until you reach the desired thickness. Taste and adjust seasoning as desired. Use a grater or mandolin to finely julienne the carrot, beets, and cabbage. Thinly slice the cucumber and tomato. 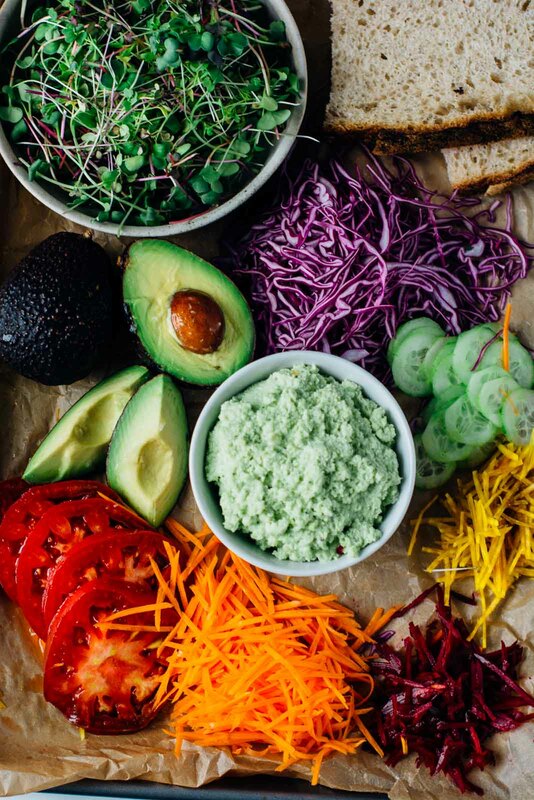 Cut the avocado in half, remove the pit and skin and thinly slice into wedges. 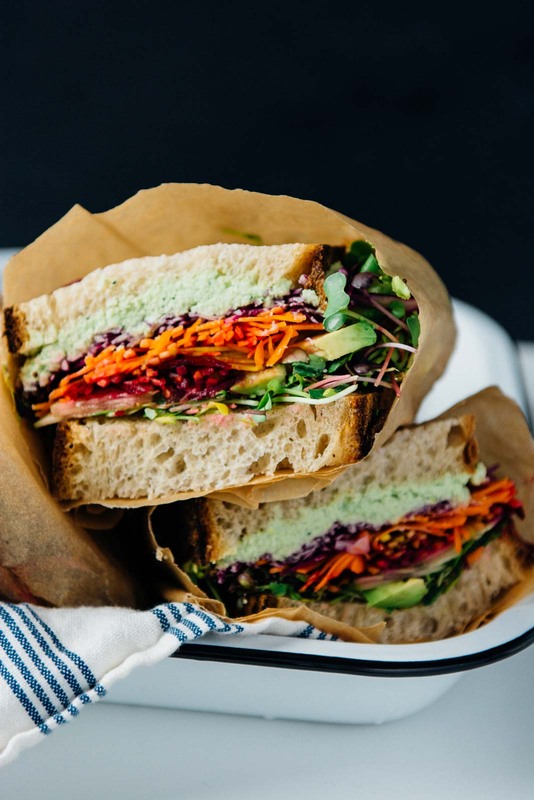 To assemble, take a slice of bread, spread a generous amount of the ricotta on top and add ½ the cabbage, carrots, and beets, cucumber, tomato, avocado, and sprouts. 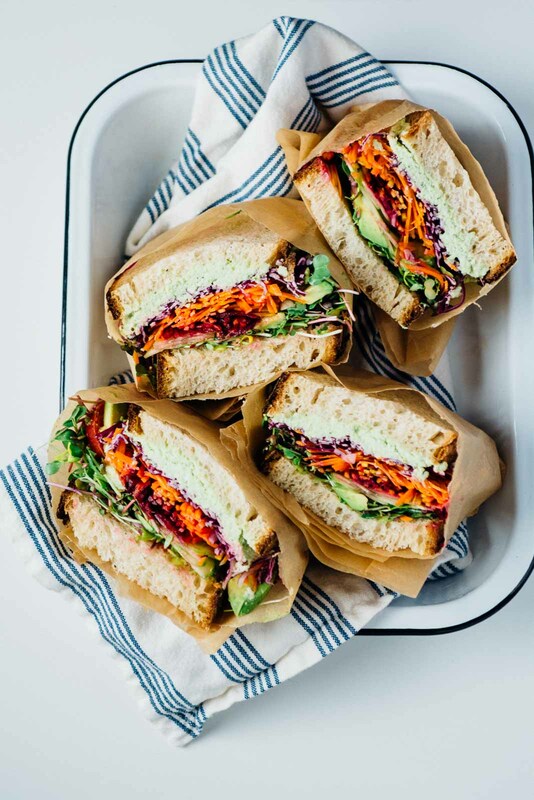 Wrap the sandwich tightly in parchment paper and then using a serrated knife cut in half. Serve immediately and enjoy! I love your recipes. I’d also love in nutritional information was included. Thanks Sue, that is very kind of you. I have considered adding nutritional information but I must be honest, I don’t count calories, it usually gets me into trouble. I did just find a new app that calculates and gives nutritional information so I might give it a try. Thanks again for checking out the recipes! Thank you, Anu. I used unbleached parchment paper to wrap the sandwiches. I also line all my baking sheets with parchment to make clean-up so much easier. 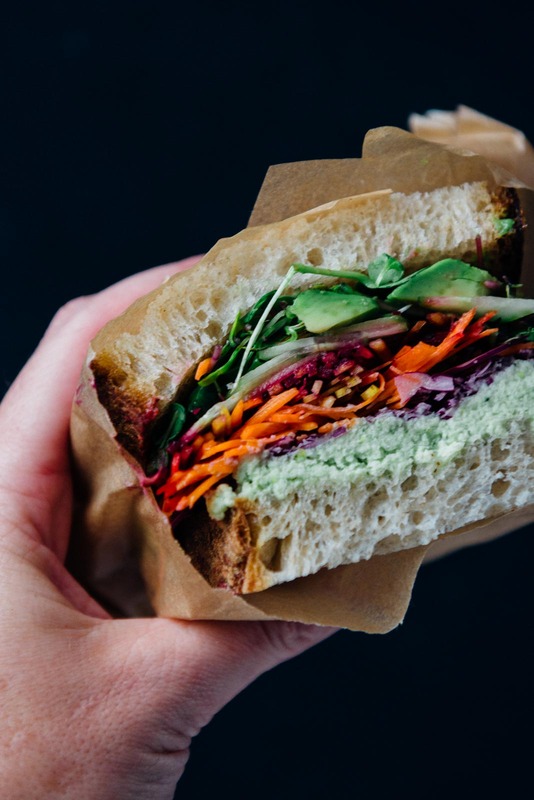 You can also purchase little parchment sandwich bags for easier wrapping and storing. Good luck with phasing out the cling wrap and thanks again for reading the blog! Thanks, Beth! It takes a bit of work to shred all the veggies but it’s totally worth it. I don’t recommend a lot of kitchen gadgets, but I can’t live without my little mandolin, I love it, and it’s so easy to clean! Thanks again for taking the time to sit and meet with us, it was really helpful!